Zoulah extends a warm witchy welcome to her Batty Tablescape! Of course Zoulah would only bring you fun bats! 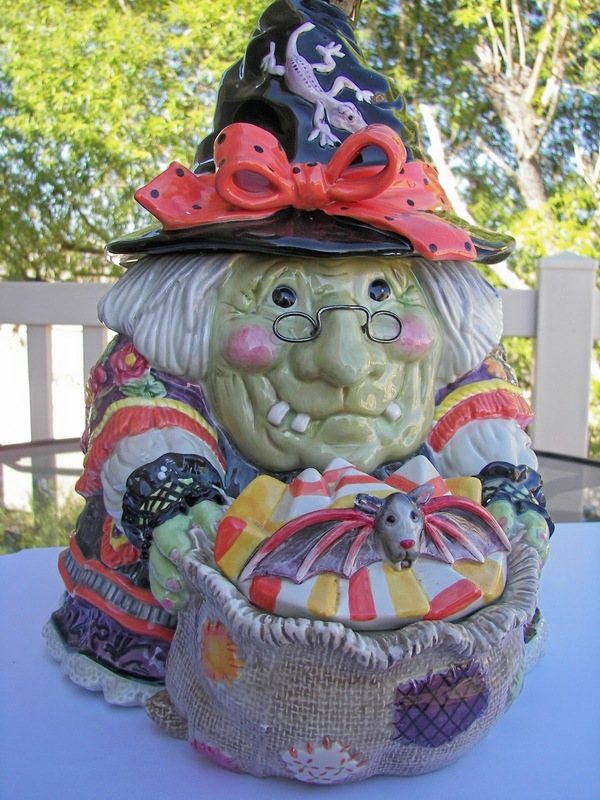 She's just that kind of witch. 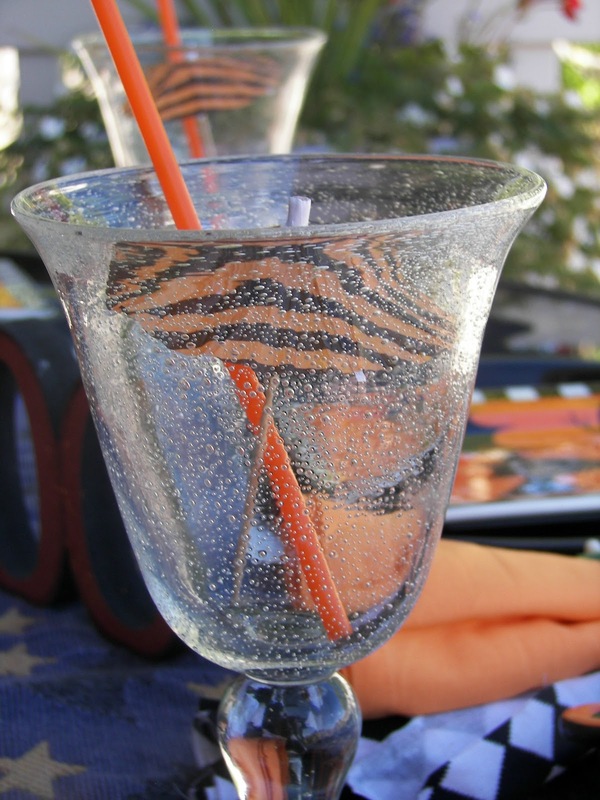 Oops, look what one of those naughty bats brought to the table. These are the wonderful, set of 8, napkin rings that I won in a giveaway at Cuisine Kathleen's. 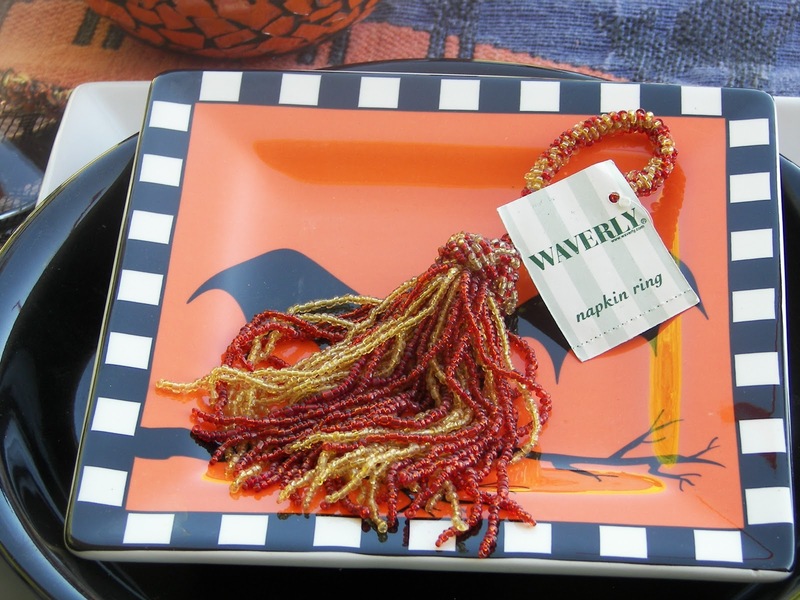 They are beautiful beaded Waverly napkin rings. Kathleeen is a favorite place of mine to visit. She is witty and full of fun. I would love to sit at her table! Her tablescapes and her food are amazing. Thanks Kathleen! I love these napkins paired with the plates. I love the little Halloween umbrellas. How about some bat chips? Boo! I hope this didn't scare you! Zoulah thanks you for dropping by! Hi....your table is just delightful. I love everything about it! I am such a Halloween fan and this is wonderful. 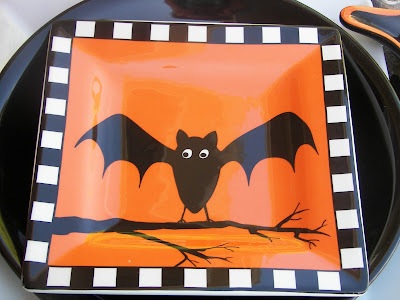 I absolutely love the bat plates... so much fun!!! Joni, This is such a FUN table. So creative, I'd love to eat here (especially tthe bat chips). You've done it again. Lucky you! I love the napkin rings! 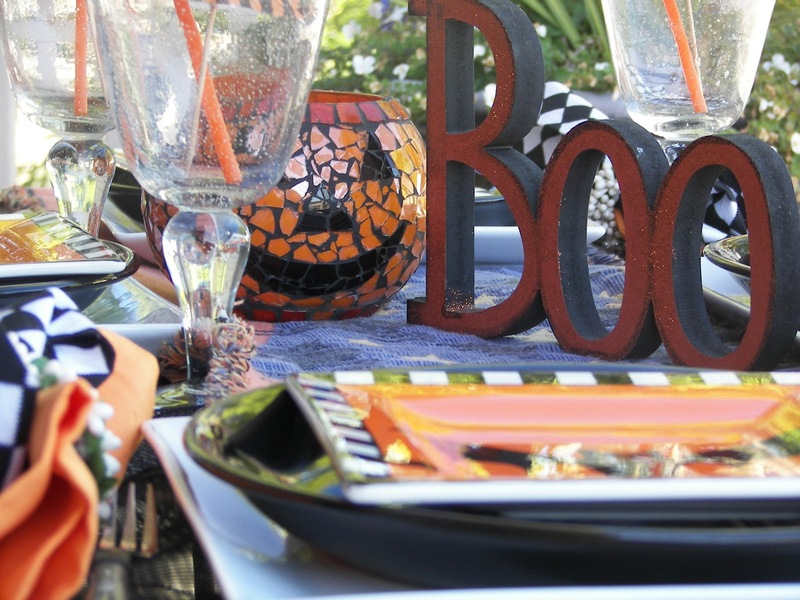 Your Halloween table looks wonderful. I really like all the great links down the side of your page too. Now that I'm home, I really need to kick it into gear and do a few tables myself. Oh Zoulah! Your table is bat-tacular! Those little umbrellas are really adorable and what fun new beaded napkin rings. I love Kathleen too, always fun to visit her place and Zoulah's too. Cute table, Joni! The napkins complement the cute bat plates perfectly. 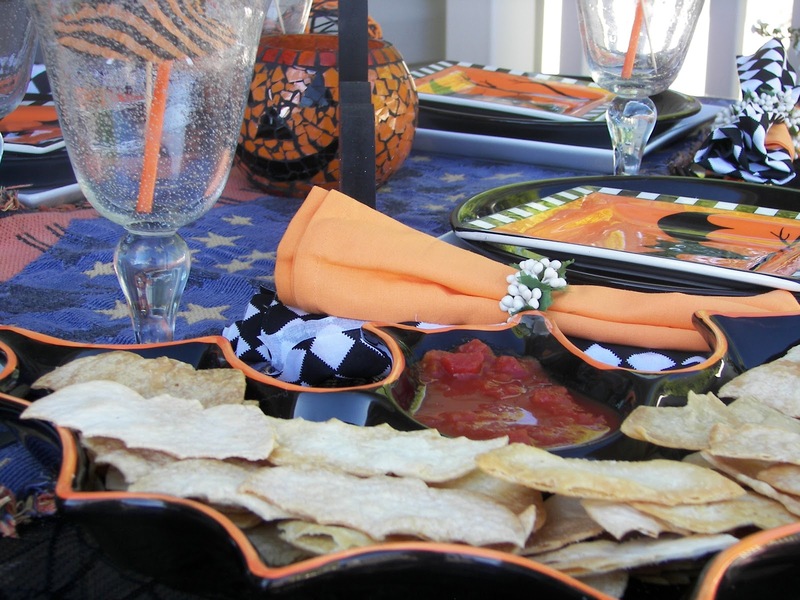 I'm batty over this table, love the bat chips! 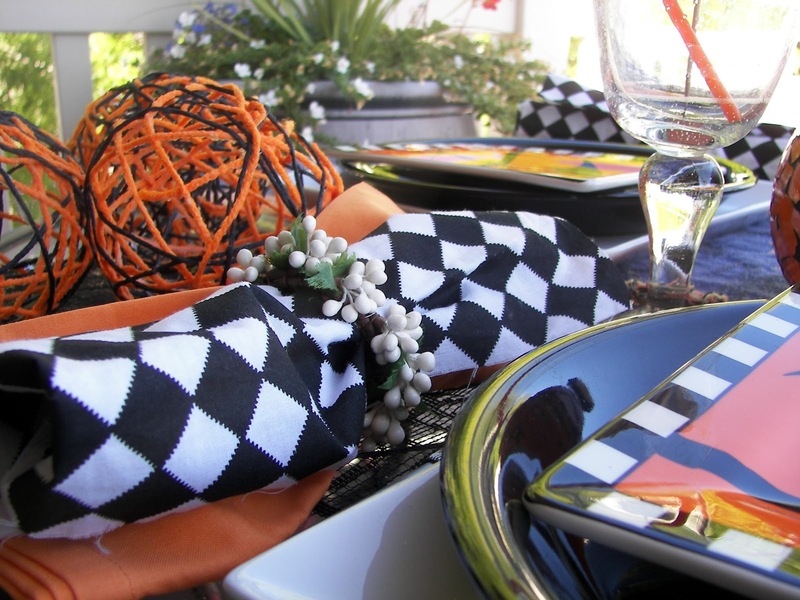 I'd like to know where you got the black and white napkins please. They are gorgeous! So much fun - wish I could join you! The napkin rings are great lucky girl. So glad you like the napkin rings! Thanks for the shout out. Love your batty table. The plates with the checked edge, great! Don't tell those toothless witches I told you, but they are over on my blog! Seriously! Great table, Joni, love the checked napkins too! This is too cute! Zoulah certain is a talented witch!! She sets a wonderful table! 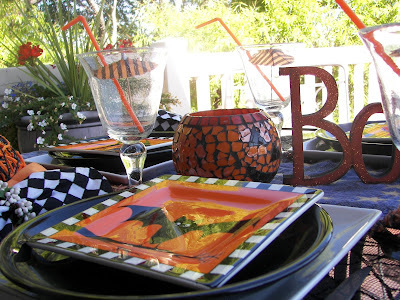 Love the square plates and that mosaic pumpkin is fabulous!! I love your napkin rings you lucky winner you. They were a great choice for this table, too. I know I've said it before but I'll say it again that I love your sweet and fun take on Halloween. Every one of your tables/posts have made me smile. You should make Zoulah proud! I love this fantastic Halloween tablescape. Congratulations on winning the fantastic napkin rings! I am envious that you still have a table set outdoors! 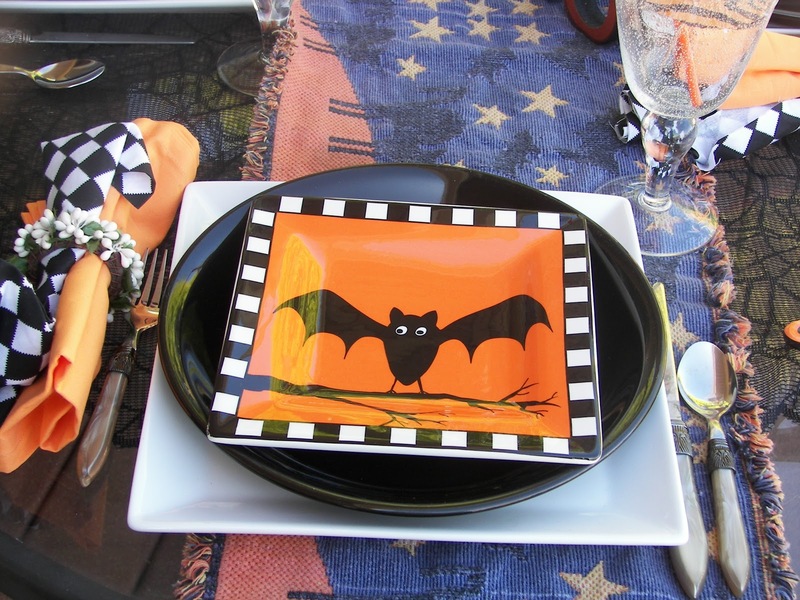 Love the bat plates and checked napkins - great combination. I love those plates, especially the checkered border!